Gennady ‘GGG’ Golovkin will NEVER outbox WBO middleweight champion Billy Joe Saunders, says the British fighter. Saunders states that Golovkin isn’t 28 anymore; he’s 35, and he will not be able to beat him in a boxing match. 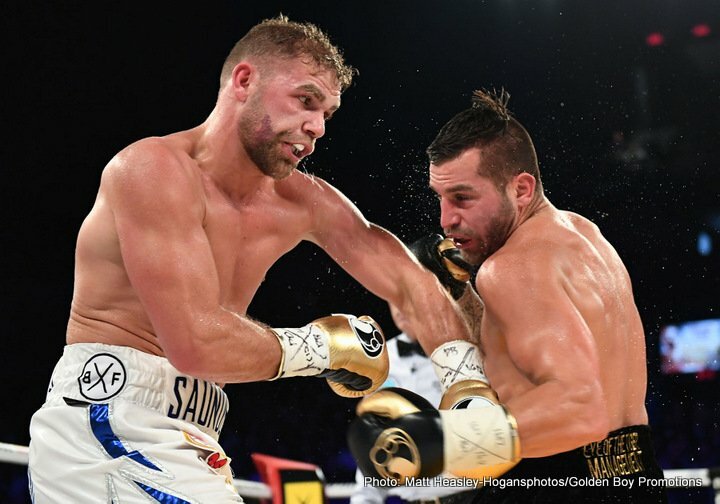 Saunders is coming off of a career best 12 round unanimous decision win over former middleweight champion David Lemieux last Saturday night in Quebec. Saunders took Lemiuex’s power away from him by using slick moves to expose him as a limited fighter. More than a few boxing fans believe Saunders can do the same thing to Golovkin if given the chance. Golovkin and Saunders could meet up next year around this same time if GGG beats Saul Canelo Alvarez in their rematch next May on Cinco de Mayo weekend. With Canelo out of the way, Golovkin will turn his sights to Saunders to go after his highly valued WBO 160 lb. title. That’s the last remaining middleweight belt that Golovkin needs to round his collection of 160lb straps. You can bet Saunders will use that title to lure Golovkin in, and force him to travel to the UK before agreeing to make the fight with him. “Golovkin’s got good power, good pressure, good footwork,” Saunders told the BBC 5. ”He’s not 28 anymore, he’s 35, to stand back and box me would take a lot…he would never outbox me,” said Saunders. Saunders is being compared to Dmitry Pirog in terms of talent and boxing style. A lot of fans might not remember, but Golovkin was scheduled to face Pirog in 2010. The fight never happened due to Pirog suffering a bad back injury while training. The injury ended Pirog’s career prematurely just as he was at the top of his game following a 5th round knockout win over Daniel Jacobs. Saunders vs. Golovkin could be the Pirog fight that never happened. It’ll be an interesting match-up of styles. Golovkin is the seek and destroy fighter going up against Saunders, with his slick Pirog style of fighting. Saunders’ punching power is very much underrated. He hits harder than most people think he does. Saunders had Lemieux badly hurt one occasions in the fight. Had Saunders gone after Lemieux with a flurry of shots, he very likely would have finished him off. Saunders said afterwards that his trainer Dominic Ingle didn’t want him to take the chance. Saunders could have done it through. Lemieux’s face was badly swollen up with his nose looking bloody by the end of the fight. Saunders has the power to hurt Golovkin if he can land enough shots.